Have you heard about the current craze for adult colouring books? They’re not, as more than one person has suggested to me, colouring books with ‘adult themes’. I think that’s an even more niche market that’s yet to be tapped. Maybe I should trademark the name Fifty Shades of Colouring?!? 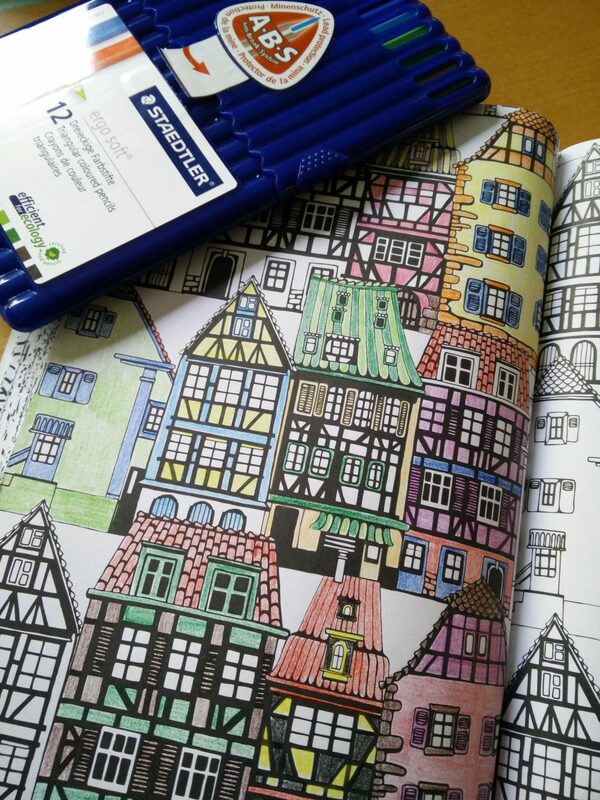 The idea is to get stressed-out adults doing colouring in, and in so, improve their mindfulness (i.e. stop them stressing out about everything) at least for a short while. And lest you think the idea sounds like the ramblings of a crazy person, this is a real thing. Check our the online book charts. Adult colouring books have been occupying several of the top-10 best seller spots for months. Well I decided to order a couple of books which arrived earlier this week. I then realised, because I’m not 10 years old any more, that I don’t have a ready stash of colour pens and pencils. So I had to go out and buy a set of pencils as well. I was slightly nervous about having to explain myself to my good lady wife. Would she think I was bonkers, or having some kinds of break-down, if I suddenly announced that I was going to do some colouring in? Well as it happens, she had already heard about the craze for adult colouring in, and was just as keen to give it a go. It was a good job that I had ordered two books, as for the next 30-40 minutes (while dinner was cooking) we both sat at the kitchen table colouring in. And you know what, it was quite calming and therapeutic. I found that I was quite a stickler for making sure I didn’t draw outside the lines – and to ensure that, I had to concentrate harder, and take thinks a bit more slowly – and as such, it just increased the mindfulness on this task.